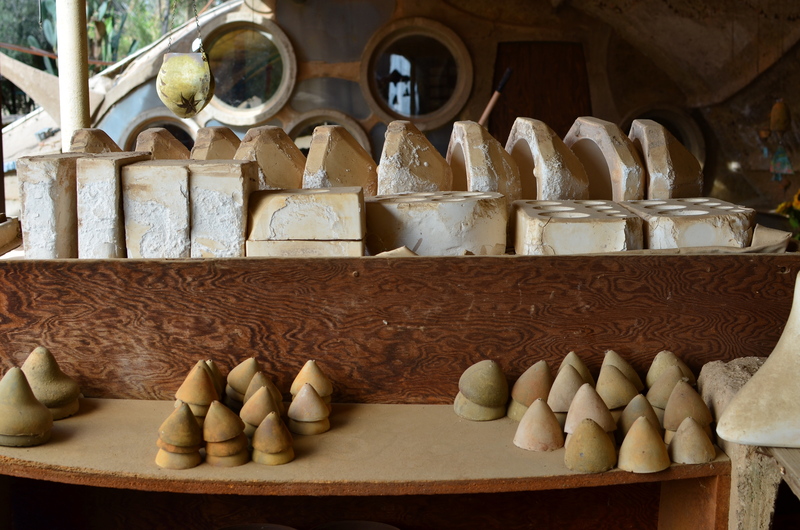 Clay pre-firings and molds for bronze bells at Paolo Soleri’s COSANTI studios in Paradise Valley, Arizona. 1/20 sec., f/5.6, ISO 100, 35mm. IN 1956, ARCHITECT PAOLO SOLERI BEGAN THE FIRST MINIATURE DEMONSTRATION OF WHAT WOULD BECOME HIS LIFE’S WORK, an experimental, self-contained, sustainable community he called Cosanti. Erecting a humble home just miles from his teacher Frank Lloyd Wright’s compound at Taliesin West, in what was then the wide-open desert town of Paradise Valley, Arizona, he started sand-casting enormous concrete domes to serve as the initial building blocks of a new kind of ecological architecture. And, over the next half-century, even as Soleri would call Paradise Valley his home, he would construct bigger versions of his dream city, now renamed Arcosanti, on a vast patch of desert between Phoenix and Flagstaff. The project, which at his death in 2013 was still unrealized, was funded over the years by the sales of Soleri’s custom fired bronze and clay wind bells, which became prized by Arizona visitors from all over the world. 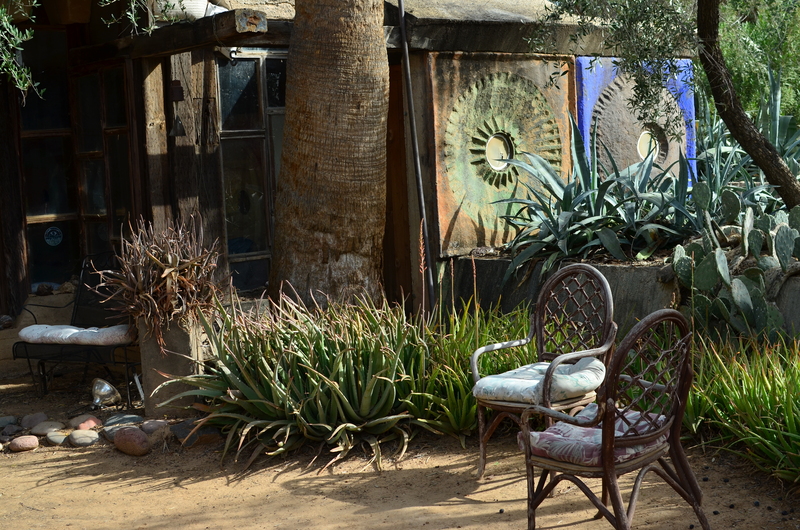 At present, his early dwellings still stand, as do the twisting, psychedelic paths and concrete arches that house his smelting forges, his kilns, the Cosanti visitor center, and a strange spirit of both wonder and dashed dreams. It is a magnificent ruin, a mad and irresistible mixture of textures for photographers. One of COSANTI’s bizarre dwellings, scattered amongst the compound’s forges and kilns. 1/400 sec., f/5.6, ISO 100, 35mm. Name the kind of light…….brilliant sun, partial shade, catacomb-like shadows, and you’ve got it. Name the material, from wood to stone to concrete to stained glass, and it’s there. The terrain of the place, even though it’s now surrounded by multi-million dollar mansions, still bears the lunar look of a far-flung outpost. It’s Frank Lloyd Wright in The Shire. It’s Fred Flintstone meets Dune. It continues to be a bell factory, and a working architectural foundation. And it’s one of my favorite playgrounds for testing lenses, flexing my muscles, trying stuff. It always acts as a reboot on my frozen brain muscles, a place to un-stall myself. Here’s to mad dreamers, and the contagion of their dreams. This entry was posted on February 22, 2014 by Michael Perkins. It was filed under Architecture, Arizona, Arts, Available Light, Composition, Textures and was tagged with Architecture, Arcosanti, Arizona, Ecology, Experimental, Phoenix.